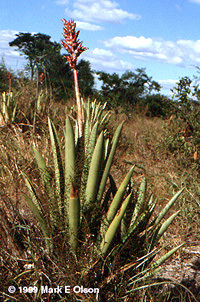 Large terrestrial bromeliad (Bromeliaceae) Aechmaea distacantha. Like many bromeliads, A. distacantha catches water in a cup formed by its leaves. The water in the cup is used by the plant but is also a valuable resource to many small animals.